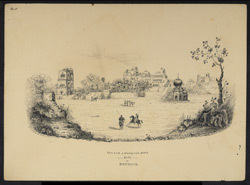 Pen and ink drawing by Frederic Peter Layard (1818-1891) of the Palace of Kharak Singh at Bhadaur in the Punjab, dated 1842. The image is inscribed: 'Palace of Kurruck Sing - Raja at Bhudour. F.P. Layard. Sukkur 1842. Sketched December 14th 1841'. Kharak Singh, son of Dip Singh, was one of the Bhadaur Sirdars. At the time of the Sutlej campaign he gave assistance to the British with an army contingent and supplies.